The hunting definition or moose hunter's glossary is here to clear up some of the terminology that novice hunters may not understand. Written with the novice hunter in mind, experienced hunters may also benefit from some of the terms and definitions. A lot of writers, including myself, often forget that the reader of any given article may not understand the terminology used in the editorial. Therefore I will attempt to add some clarification to some of the terms used by outdoor writers. 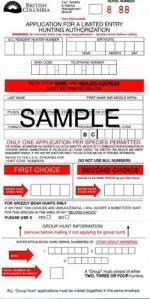 Outdoorsmen/women are looking for information on how best to locate wild animals. I write my articles to help you succeed in your goals. Unfortunately there are often times when a writer, with good intentions will write an article that to the inexperienced will just-not-make-sense! Have you ever read an article and come across a term or theme based article that just doesn't gel? There are many studies written by biologists, scientists and PhDs that are meant for scholars. Do you or have you ever read one of those papers? Sometimes the language used, takes what could be a very interesting article and turns it into gibberish. Unfortunately scholarly papers are, for most part not meant for us laymen to read or understand. The accompanying tables, charts and figures often leave us more perplexed than if we had never read the article in the first place. My wish is for The Hunting Definition - Moose Hunters Glossary, to shed some light on these eye-blurring-doctorial papers and to define some common terminology used by writers. This page I am sure will have its shortcomings, so I will ask for your forgiveness in advance. If you know of a term or definition that I haven't listed or have more information about; please contact us and we'll be more than happy to consider your contribution. The process of hunting and gathering has been with mankind for millennia. The act of hunting may include the use of modern day weapons or those of centuries past, the primitive. Most authorities believe that man arrived in North America via the Beringian Connection which was a land connection (as the ice fields receded) between the old world and the new world. It is believed that man and moose arrived at about the same time period, somewhere between 10,000 and 70,000 years ago. In the north where food was scarce it was often feast or famine. Because caribou were of the migratory type; as a food source, were not always available. The moose however were available as a food source year round. The early natives' hunted moose, using primitive weapons, such as knives, spears and clubs. Natives across the moose range have said the moose is the most difficult animal to kill while the buffalo is the easiest. Teddy Roosevelt said he thought hunting moose was par with hunting whitetailed deer, being they were somewhat more wary than elk or mule deer. As moose populated North America they spread across the entire tundra, the boreal forest, the pacific coast and the northern intermountain and eventually the southeast. Moose are not tolerable of extreme temperatures and at least initially inhabited areas of temperature ranges of -20° C (-5° F) to 15.5° C (60° F). Moose in winter coats are stressed at temperatures above 5.1° C (23° F), moose in summer coats suffer stress at temperatures above 14° C (59° F). It is unknown exactly what the lower threshold temperature is for moose. They have been observed at temperatures below -40° C (-40° F) and thriving. The easiest time of year to hunt moose is during the rut. The rut (moose mating season) typically is 15th of September through the 30th of October (rough dates). The peak of the rut is usually the first two weeks of October. Of course these dates can vary from region to region. Moose are easiest to hunt at this time of year for a few reasons. 1) They are vocal at this time of year. Both sexes become vocal. Cows will moan (Ahhhh, with a quivering pitch) and bulls will grunt (Orgh) in response. 2) Because both sexes are looking for mates they tend to be less cautious in their travels through the forest. First nation's tribes used various methods of hunting moose before the introduction of the firearm. These methods included but were not limited to: chasing moose by canoe while they swam (bulldogging), spring moose hunting in deep crusted snow, snaring and driving moose into narrows or traps. 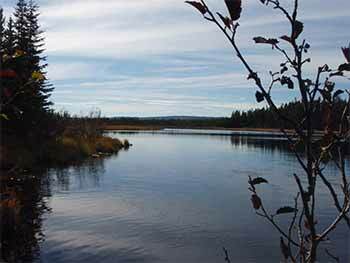 Governed by authorities has typically regulated moose hunting to the fall seasons. 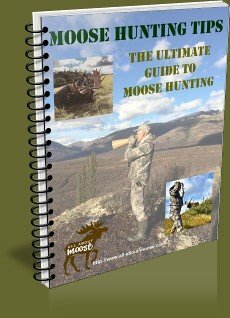 Today's moose hunting techniques are limited to firearms (smokeless and black powder) and archery tackle. Archers equipment consists of the long bow, compound bow and much to the chagrin of some archers (the purists)... crossbow archers. One of the most satisfying ways to hunt moose is to call them. 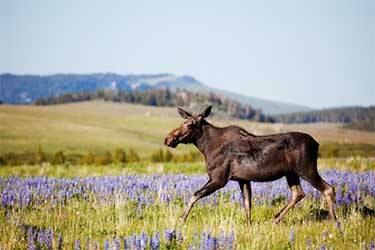 Calling moose originated in the Northeast and was documented as early as 1855. Calling moose during windy periods is not considered an effective moose hunting technique as the moose are more wary during times of windy conditions. To call moose within a few yards is an exciting experience. The hunters or photographers can be close enough as to actually hear the great animals breathing. Hunting Definition - Stalking or "Still Hunting"
Not so still actually. The act (or art) of still-hunting actually involves movement. The hunter or photographer moves slowly, stealthfully towards the intended target. The technique of still hunting involves for the most part – taking a few steps then watching and listening, scanning the area 360 degrees looking for sign. Possibly an ear or patch of fur that will be visible though a small opening, may be the only clue an animal is close at hand. 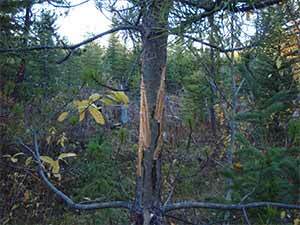 This method of tracking moose or deer can be quite rewarding too! The watchful eye may notice freshly browsed willows on which some saliva still clings. Imagine your excitement at finding a partially chewed leaf, dropped while the feeding animal reached for a new mouthful of leaves or grass. You would know your quarry is close at hand. When approaching an animal that is, or was feeding you may find them bedded down. Wistfully ruminating, resting before the next feeding period. Always try to approach an animal from the downwind side, if they smell you or hear your approach they will surely escape before you discover them. Moose have a habit of circling downwind just before they bed down, this way they back-track and will discover predators that may be following. Generally, stalking or still hunting is considered to be the most difficult to be successful at. This is because a moose (or deer) at rest is completely aware of his surroundings and will detect seemingly imperceptible sounds and movements. Moose will bed in the thickest areas of the forest to avoid detection, the stalking hunter must use his absolute best moose hunting techniques to outwit a moose at rest. 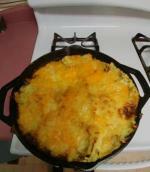 Food made from boiled and pulverized moose bones and moose marrow. 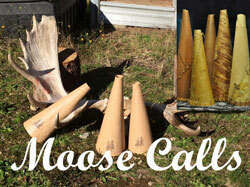 The traditional call made from rolled birch-bark. Also known as a Moose Horn. The period of time in which a cow moose will allow a bull to mount. The estrus can last for as little as 1 hour to as long as 36 hours, the average being from 15 – 26 hours. It is generally understood that moose have poor eyesight; although little is known of the acuteness of their vision. However; it is known that moose must move their heads in order to see objects at close range. Unlike humans moose have the ability to move their eyes independently. Moose rely more upon their keen sense of smell and hearing than that of vision. Moose will feed during a moonlit night or from an hour or so before sunrise to about an hour after sunrise before going into the forest to bed down and ruminate. Again in the evening moose will become active and browse until well after dark. Moose are most easily called and enticed in the morning, especially if the pursuer begins calling an hour or more before sunrise. Getting their interest and having a moose expose himself is much easier before they bed down. Once bedded, they will listen with great interest to your calling; later once the moose begins his feeding pattern he may investigate the luring sounds which you were wistfully sending out into the woods. Too bad for you if you are not still there! Sometimes moose will not investigate right away; it may take several days before he gets to the area from where you were calling. 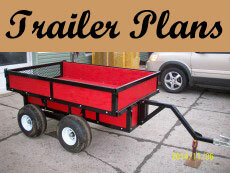 Most experienced moose hunters will target a specific area for several days in a row before moving to a new location. Bear Grass - Xerophyllum tenax. 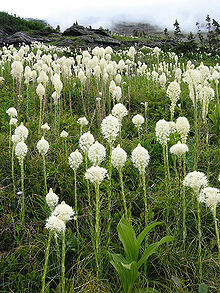 Bear grass looks like grass but is really part of the lily family. Moose have large ears and extremely sensitive hearing. Sufficient hunting gear to equip the moose hunter to facilitate in the location of moose, be comfortable and safe while hunting. The moose nose has sensitivity far superior to that of humans. Moose have huge nasal cavities which are lined with millions of moist smell-sensing cells. When a molecule of odor is sensed by one of these sensitive cells a signal is sent to the brain, and a response is triggered. The Jacobson's organ is found in the roof of the mouth. It is believed the Jacobson's organ is used to detect primarily sexual smells or odors. In order for a moose to use his Jacobson's organ he must tilt his head up, his upper lip back and open his mouth. This process of odor detection is called "flehmen". Although moose are large animals they are very difficult to count unless the inventories are competed during ideal conditions. The poor results or non-existence of these studies of some jurisdictions limits wildlife managers in their abilities to manage and estimate moose populations. In many areas of North America the study methods vary leaving it difficult to compare results from one area to another. However; often enough data is collected to achieve a confidence level of moose population densities. A firearm with capable of discharging a bullet with sufficient energy to dispatch a moose humanely and efficiently. In past millennia first nation's tribe had certain firm beliefs regarding moose. One belief of significant proportions was that moose would give themselves up to hunters who showed respect and dignity to the survival of the species. Hunters, it was believed, could search for and attempt to locate and kill a moose; he would be unsuccessful until the moose allowed himself to be found. The moose, only revealing himself to those hunters who were competent, solicitous and reverent. The spirituality of the hunter was affirmed on each hunt. Bull moose will begin to create scent pits as early as the beginning of September, although the breeding season does not usually begin until the middle of the month. Areas of soft ground which a bull moose will scrape with his hoof and then urinate and salivate in; this is done to attract the female cow moose. This muddy area will have a distinct aroma; the male will wallow in it to perfume himself. The bull moose will check his wallow several times from creation until after the breeding cycle to see if any interested cow moose are waiting. An area where there is a sufficient food source, shelter from: severe weather, deep snow and extremely cold or overly warm temperatures.